How Many Pounds of Refrigerant, Does a Home AC or Heat Pump Hold? How Many Pounds of Refrigerant, Does an AC or Heat Pump Need? If you took a minute to step outside your house in Charlotte this week, you know it’s here… Summer! With temps floating into the 90’s for the 8th straight day, you can rest assured that Charlotte air conditioner repair companies are running full steam ahead to keep their customers cool during the heat spell. In a previous article, we discussed the cost to recharge a home air conditioner or heat pump on your Charlotte area central HVAC system, and in this Charlotte HVAC Guide, we are going to look at how many pounds of refrigerant a system can hold. The general rule amount that can be estimated is in the 2-4 pounds per ton of cooling for your system. 3-ton AC or Heat Pump with a 35 foot lineset will need a total of approximately 6-12 pounds of refrigerant, to fully recharge from empty. This includes the lineset, coil and unit. Disclaimer: This rule of thumb is VERY general and there are several variables that come into play. My Carrier 3-ton system may use 4-5 pounds, while your Goodman heat pump may use 5-6. The ONLY way to know for sure is to read the label on the side of the unit, and have your installer or service company provide the info for you. As always, we recommend comparison shopping for installation and repairs as often as you can. Just like any other factor in pricing, you may find that 3 Charlotte AC repair contractors have 3 completely different prices for the same product or service. Take a look at the important variables that can affect how many pounds of refrigerant your AC or Heat Pump may need. Probably one of the biggest factors, the size of your home AC or heat pump is going to have a significant effect on the amount of refrigerant it uses on its own, but it will also have a downwind effect on several of the other factors listed below. For example, a larger condensing unit, needs a larger liquid line on the lineset… which also means more capacity. The farther distance between the condensing unit and the evaporator coil, means a longer lineset is used to connect the two. Most AC units come from the factory with enough of a charge for the unit, and 15 feet of lineset. Longer distances require additional refrigerant. Larger capacity units also use a larger diameter tubing on the lineset, which will require more refrigerant. If you have seen a 10 SEER system, you know they are roughly 20-30 inches tall with a 24 inch base. Essentially, a nice, small footprint. A comparable 15 SEER condensing unit may be 4 feet tall, with a 36 inch base, and be 2-3 times the size of the lower efficiency unit. This is due to all the extra coil surface required to generate the higher efficiency cooling, and thus… more refrigerant is needed to fully charge the coil. It’s common to use a larger evaporator coil with an AC unit. In most cases, it can provide higher efficiency due to the larger coil area. Along with the added coil surface, you may need additional refrigerant capacity to fill it. A split system, where the condensing unit is outside and the air handler, furnace and coil are inside (aka Split) is going to have to accommodate for different coils, linesets, and several other factors that were determined by the installer when the unit was first put into use. A Packaged HVAC System, or “All in One” has everything in one cabinet outside the home. There are no different coil sizes to deal with and the lines connecting everything are self-contained in the same box. How to Be Sure You Get The Right Amount! 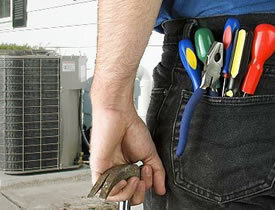 Fortunately, most Charlotte AC Contractors are honest and treat customers fairly. If you think you may have been taken advantage of during a recent home ac recharge, make sure you ask them about it and give them a fair chance to explain their pricing and reasons for using the amount of refrigerant they did. just had our system charged with a new evaporator coil replacement. 2 and half ton ac and coil took 7 pound of refrigerant. Our coil and ac are approx. 15 feet apart. The coil was bad, so we had to have it done. We installed a 4 ton outside unit. Will our 3 ton inside coils work with it? @ Jack Barnes – Definitely a “No”. In reality, your three ton coil may work for a short period of time, but its not large enough to adequately dissipate the cold temps of the refrigerant and will turn into a block of ice. In addition, if your indoor furnace or air handler only pushes 1200 cfm of airflow, even if you put a 4-ton coil onto the unit, you may have problems with icing up. You may need a higher capacity blower in the furnace as well. Just had a new 2 ton put in, the line just a foot away from the unit leak out the refrigerant. Why do I pay $150.00 more for the repair. We solved my air conditioning problem from above. My unit kept freezing up. I was told my outside unit leaked and needed replaced. I replaced the 3 ton unit with a 4 ton unit. It still froze up. I was then told I need new coils and a new blower to handle the air flow of the 4 ton unit. I couldn’t afford this. I found that my son in law had a friend that was an air conditioning man. He looked at it and found the $8.00 capacitor had shorted out and said that was probably all that was ever wrong with it. Now that 4 ton will freeze you out of the house. By the way I live in a 75 foot trailer house.